Repairing automobiles can be tough sometimes and other times can seem to run outside of the normal mode of operation. Case in point, recently we had a customer request that we check for a bizarre smell coming from the interior of the vehicle. Customer also indicated that he heard an odd noise when the A/C fan was switched on. Upon inspection, the technician relates the smell to animal decomposition. 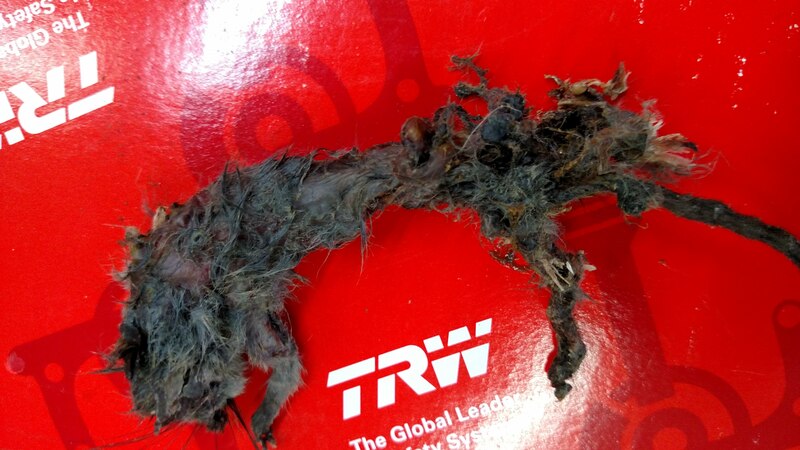 Further inspection revealed that there was a dead rodent within the A/C Heater ventilation system. Further disassembly revealed the reason for the odd noise the customer reported earlier was due to the rodent’s failure to observe the “CAUTION – MACHINERY / MOVING PARTS” which lead to his demise. This guy failed to observe the “CAUTION” warning inside of the pathway to the blower motor of the HVAC system.